If ever a poster didn’t do its film justice, this is it. 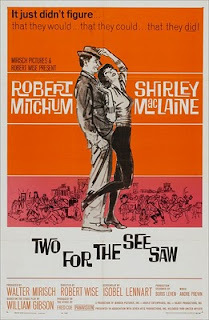 The darn thing is too heavily steeped in what we (I’m a graphic design professor) have a tendency to call 101-Dalmatians-style to suggest the content of the Robert Wise’s Two for the Seesaw, which while romantic, is too tinged with melancholy and loneliness to be captured in this light-and-bright style. 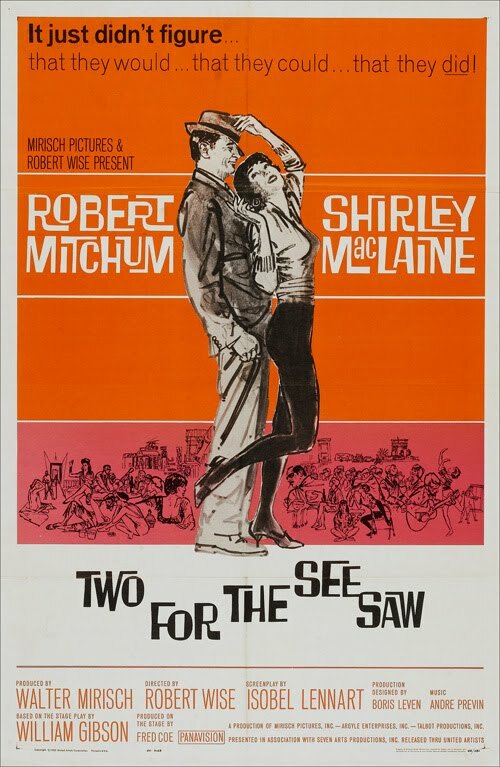 Robert Mitchum stars as an attorney from Omaha who flees his failing marriage for the streets of New York, where he chances upon an unusual romance with Bohemian dreamer Shirley MacLaine. Seldom was Mitch’s signature world-weariness put to better use. He comes across beautifully here, channelling (ha!) all of the alienation and loneliness that one can feel amidst the canyons of Manhattan into his role. Though the films have nothing in common, Mitchum is almost as good here as he would be as Eddie Coyle more than a decade later. While Mitchum is thought of as a screen persona (or force of nature) more than as an actor, he holds his own quite well opposite the incredibly gifted MacLaine — she of the Best Actress Oscar and trio of Best Pictures. The clash of his repressive midwestern morality versus her Greenwich Village flightiness makes for an interesting contrast in the early scenes. The film is primarily concerned with how the pair manage to contrive a romance in spite of their differences. Before I get any farther, I have to talk about Ted McCord’s black-and-white cinematography for Two for the Seesaw, which is among, I kid you not, the best in the history of Hollywood. I was able to watch this recently in high-definition on the MGM HD channel, and found the depiction of the streets of lower Manhattan to be nothing short of staggering. As a film noir enthusiast, this film ironically boast one or two of the most iconic representations of not only the urban landscape, but of a trench-coated protagonist among them. There is a scene in the middle of the film that finds a chain-smoking Mitchum waiting on a dark street outside MacLaine’s apartment following a bitter a quarrel. Mitchum is framed so beautifully against the deserted streets that my breath literally caught in my throat. At the conclusion of the picture, I rewound to the moment and enjoyed the frame for quite some time. McCord had a long-lasting career in Hollywood, but he isn't particularly well known to film buffs. His two biggest credits are East of Eden and The Sound of Music, as well as a three or four B-noirs. Wise however was a visually stylish director, especially when utilizing black-and-white, and the two worked together here to craft a sensuously, richly beautiful film — all the more surprising considering theatrical source material. It has been said by some that Mitchum and MacLaine don’t have solid chemistry and the film is too long, but I disagree and would advise anyone to see this and judge for themselves. See this for the performances, for the beauty of the filming and of the city, and for the verve of Andre Previn’s great score. Just do me a favor and see it. Although this does air on television from time to time, it isn't generally available otherwise, having never been widely released on DVD. It was recently made available from Amazon.com as a made-on-demand DVD, in much the same fashion as the Warner Archive DVD series. Availability: Amazon DVD on Demand.